Events in Hampshire during July bring summer fun and lots to do. The thoughts are on holidays or a short break maybe. Why not combine a short break and an event that interests you and your family. Winchester Hat Fair 5th to 7th July 2019. Winchester smiling! The wonderful Street Art Festival that takes place every year. Expect the unexpected again this year the organisers say, and it always happens!! Hedge End Carnival on 6th July 2019. It has been going since 1921. South Downs Way. Winchester to Beachy Head! 6th July 2019. 100 miles or 100 km. 90% off road. When there are downs there are ups and this cycling event has its share. Curdridge Country Show This is the 62nd show to be held on 13th July 2019. Andover Carnival will be held on 21st July 2019. Mega Meon Sportive No 2019 information at time of writing. Starting at South Downs College, College Road, Waterlooville. Another lovely ride through the enchanting Meon Valley. Farnborough Air Show will next be held in 2020. A once every two year show this is one of the leading air shows in the world. The first five days are trade days but Saturday and Sunday the show is open to the public. Festival of Archaeology 13th to 28th July 2019. Over 1000 events held all over this country that is so rich in prehistory. There are many events being held all over the country. The events this year will form part of the 75th anniversary of the Council for British Archaeology. Fordingbridge Summer Festival 20th July 2019. The New Forest and Hampshire County Show will be held on 30th, to 1st August 2019 at The Showground, New Park, Brockenhurst. A very pretty venue. Great family day out. Free car parking. This show has been held for over ninety years. 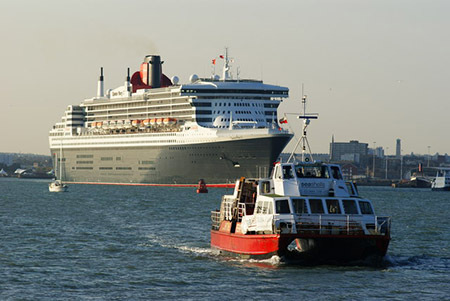 Hythe – The Queen Mary with Hythe Ferry in the lead!! Hythe is on coast of The Solent. Great place to view the busy waterway. Popular sailing place too. Close to The New Forest. Bit expensive to live there perhaps! Winchester is smiling during this delightful event!! As they say "the Art of the Unexpected!" Great fun. An ancient city in playful mode! Hedge End is a small town a bit to the east of Southampton. It has developed over hundreds of years. Nowadays close to the M27 motorway it is a thriving community. Alton Famous for its delicious watercress and the Watercress Train Line! Jane Austen lived at Chawton which is not far away. Popular town with residents and tourists! Queen Elizabeth Country Park is a really beautiful big park that includes Butser Hill. Venue for many events and a lovely place to visit anyway. It is close to Petersfield and the A3. Farnborough home of the famous Air Show of course and also of the Air Investigations Branch. The Abbey is the burial place of Napoleon III. The local authority are modernising the town over a period of years. Hillier Gardens is on the edge of attractive Romsey in the Test Valley. It has a popular garden centre so if you are interested in plants a visit there would be interesting. Curdridge is south of Winchester and only a few miles from Southampton. This close to The Solent accommodation could be found in the locality for touring the area. 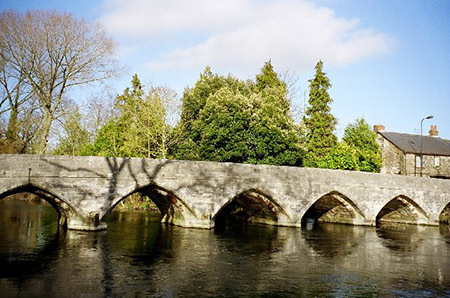 Fordingbridge is on the River Avon and close to the county boundary in the New Forest. With its name it is obvious that this was an ancient crossing place for the river. The first bridge is recorded in c1252. As The Avon Path passes through the town it is well known to hikers. Waterlooville is a fast developing town not far from Portsmouth. It is one of several small places close to that city. Brockenhurst This is a lovely area in The New Forest. Think about it, trees, streams, ponies and deer all close to this large village. No wonder everybody everywhere makes for the Showgrounds in July! 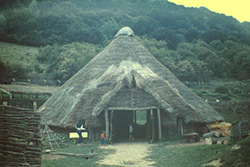 An Iron Age Farmhouse recreated where it stood on Butser over a thousand years ago.